"Winter is coming" It's here! This was my view this morning when I got the paper. 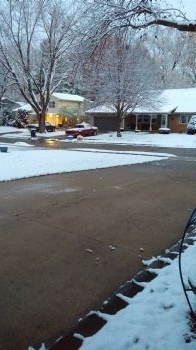 Not doing a whole lot of melting but at least the roads and sidewalks are mostly clear. Not really ready for this. But it happens. Life goes on - albeit at a slower driving speed! Here in NE Florida we still in the mid to high 80s during the day and dropping to 60s in night. We had snow this morning but most of it has melted. Ugh. This time of year I am so glad I live on the east side of the Bay Of Fundy, we have glorious sunshine and +10C today with some rain and even warmer tomorrow. Once the ocean water begins to cool then we will experience winter conditions. Be safe driving and stay warm everyone. It’s wet snow here today, probably no accumulation, but I’m still whining about it!! I’ll try to grow up before the end of the day!